← Building a backyard studio – almost finished! The classic Boss DS-1 with stage 1 of cubisteffects magic. The Boss DS-1 Distortion pedal is a fairly common pedal amongst guitar players. It was my first ever effects pedal, and I am sure it was many players first pedal. It has very basic functionality, and especially after manufacturing of Boss pedals moved from Japan to Taiwan the quality of the components dropped somewhat. This all results in very basic tone shaping, and quite a bit of noise and hiss depending on how high the levels are turned up on the pedal. I recently pulled out my long-dormant DS-1 to try it out with my Blackstar HT-5 head as an overdrive to push the amp’s dirty channel a bit harder for solos, and quite liked what it could do, but found it a bit noisy. It also sounded a little too twangy for high gain when I used my RG550 with modded PAF Pro. I talked to Christian over at cubisteffects about options for dropping the noise levels on the DS-1, and maybe changing the sound of the pedal a little. Christian kindly sent out to me a package of ‘top secret’ parts for 2 stages of DS-1 modifications. The first stage was to make the DS-1 operate a bit more quietly, and round off the sharper high end tones. The second stage is a JCM Marshall tonal change. Last night I successfully completed the first stage modifications, thanks to a little help from Christian. This was my first attempt at modifying an effects pedal, and despite one scare everything is working well. My DS-1 now sounds a lot clearer, and the distortion is smoother, with all the sharp buzzy edges rounded off. There is less noise and hiss, and despite the single tone control I could dial up some pretty nice low and high gain tones on the clean channel of my HT-5. As an overdrive it sounded far clearer as well. The overall tone hadn’t changed too much, but it was noticeably ‘better’. I cannot wait to try out the JCM mod over the weekend, but I will try to record some samples of the pedal at it’s current state of tune before I start on the second stage of modifications. Here are some samples of the stage 1 mods. First 1 is suing the clean channel of my Blackstar HT-5 and the pedal being used the primary distortion. The second is using the dirty channel, and the DS-1 is being used as an overdrive. Please excuse the rough samples. I’m running the direct in of the HT-5 to my sound card, so quality is a bit sketchy. I hope you get the idea. A very special thanks goes out to Christian at cubisteffects for generously providing me the parts to do these modifications. 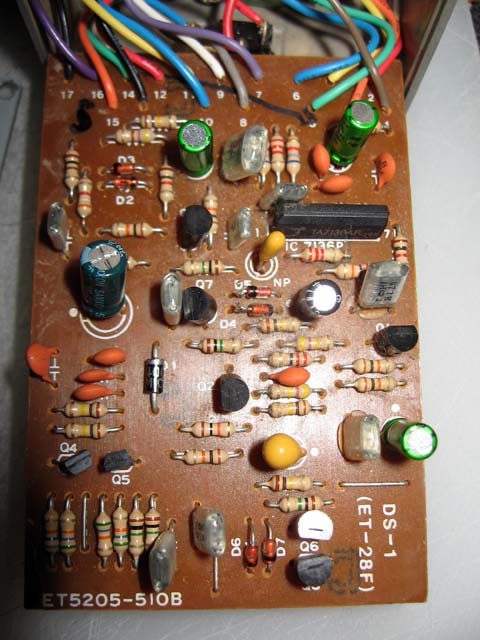 7 Responses to "Modding the Boss DS-1 – part 1"
Well done. I’d love to hear clips of the Noise Reduction mod alone. Hey mate, thanks again for the parts. Just about to add my somewhat rough samples to the post shortly. Awesome! Nice job.. sounds great. I’d like to give this mod a shot as well. Hi. Want to ask which version of the DS-1 you have here? Taiwan or Japan made? Thanks. Hi there Lim. This was an early Taiwan made DS-1. It was built to the same specs and parts list as the Japanese made ones. Are not the caps, its the circuit itself, There is a mod who can cut the noise a lot, the lone diode in the circuit close to the ic replace with a mosfet transistor in series with anoter silicon or germanium diode, in the vintage DS1 is problably a bit different the location of this diode, there is a couple of missing opportunities in this pedals that modders ignore and increase the distortion and the overall tone structure, i will highly recomend to use germanium 1n270 diodes for clipping, they won’t sound “tubey” , They will sound warm and full and still will have incredible distortion.